Like many people say, breakfast is the most important meal of the day; even for a RuneScaper. The Cooking skill is used to cook raw food such as pie, pizza, and fish so that it can be eaten by players to restore missing Life Points, or to temporarily boost skill levels. There are many different types of food in RuneScape, each requiring a certain skill level to cook, and each food has its own effect when eaten. Before raw foods can be eaten, they must be cooked on either a Range or a Fire created using the Firemaking skill. 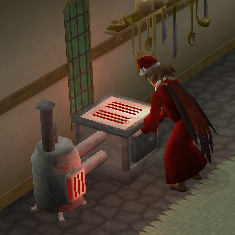 Cooking Ranges are found throughout RuneScape, and are marked on the map with a Cooking Pot ( ) icon. One benefit to using a Range is that these appliances offer a lower burn rate than that of a Fire. 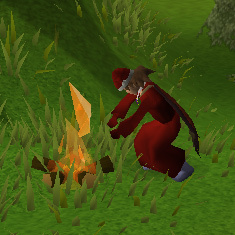 There are also other objects found around RuneScape which can be used to cook food, including the Sulphur Vents of TzHaar, everlasting Campfires, and Iron Spits. While meat, fish and stews can all be cooked over a Fire, most other items including bread, pizza and pie must be cooked on a Range. The exception to this includes foods such as Raw Chompy and Raw Rabbit, which must be cooked on an Iron Spit. To cook an item, simply "use" the raw food with a Fire or Range. If you are carrying multiple pieces of the same food, a cooking dialog will appear allowing you to select how many of a given food you would like to cook. After selecting how many you would like to cook, click on the picture of the food and you will begin cooking them, one at a time. By default, you will cook all of the selected item in your inventory. During your adventures while Cooking food, you will undoubtedly burn some of your food, yielding a burnt item. These items cannot be eaten, and are for the most part, useless. Burning food yields no experience. As you continue developing your Cooking skill above the required level for a given item, you will find that you are gradually burning less food. Some foods, particularly those in the low to mid level range, have a point at which they will no longer be burned once a player reaches a certain level. As explained above, cooking food on a Fire increases the chance that a raw food item will be burned. Regular ranges have a better chance at cooking food properly. There is also a special Cooking Range located in Lumbridge Castle, which further decreases the chance of burning food when a player cooks on it. To use the range, players must complete the Cook's Assistant quest. For members, wearing Cooking Gauntlets will decrease the chance of burning fish when cooking on a Range or Fire. Cooking is quite an expansive skill, and as such, there are many items that players will need to be familiar with. Depending on what you are cooking, you may need one or more of the following items to make your food. Made with the Crafting skill. Bought from the Yanille Cooking Shop. Obtained using the Farming skill. Respawns in the Falador cabbage patch, Rimmington farm, Monastery, and Draynor Manor. Respawns in the Cooking Guild. Made with the Cooking skill. Respawns at the pizza shop in the Wilderness Bandit Camp and in Aggie's House in Draynor Village. Respawns in Zanaris and the Cooking Guild. Obtained with the Fishing skill. Pick some wheat; use the wheat with a Hopper at the top of a Windmill ( ); operate the controls; collect the Flour at the bottom floor in a Pot. Bought from General Stores and Cooking Shops. Use a Bucket with a Dairy Cow. Respawns east of Canifis in the Dark Woods, east of Draynor Manor, east and south of the Draynor Village jail, and near the Edgeville Yew Trees. Respawns in Feldip Hills, Lumbridge farm and Rimmington farm. Bought from General Stores and Yanille Cooking Shop. Respawns in Ardougne farm, Lumbridge farm, Rimmington farm, and Rellekka patch. Bought in Port Sarim food shop. Respawns near the Varrock stone circle. Respawns in Wilderness Bandit Camp and Feldip Hills. Use a Bucket, Jug or Bowl with a Water Source ( ) such as a sink, fountain or pump. Buckets may collect water from a well too. Each of these creatures will drop a piece of raw meat — such as Raw Chicken or Raw Beef — which, when cooked will become Cooked Meat (or Cooked Chicken, after cooking Raw Chicken). It's worth noting that cooking a piece of already-cooked-meat will result in a piece of Burnt Meat. Snails can also be killed by members to collect their meat. These creatures are found in the swamps of Morytania, near the town of Canifis. To access this area, players must complete the Priest in Peril quest. Ugthanki Meat 1 40 30 Ugthankis are found south of the Shantay Pass. Cooked Rabbit 1 30 50 Rabbits are found in the Fremennik Province and Isafdar. Roasted Rabbit 16 72 70 Rabbits are found in the Fremennik Province and Isafdar. Cook the Rabbit on a spit. Spider on a Stick 16 80 70-100 Jungle Spiders are found on Karamja. Kill one to obtain its carcass, and then use the carcass on a Skewer Stick or Arrow Shaft. Then cook it over a fire. 5 bites Catch some Crabs (from the Recipe for Disaster quest) and cook them over a fire or stove. Roasted Beast Meat 21 82 80 Raw Beast Meat is dropped by Kebbits, Feldip Weasels and Desert Devils. Cooked Chompy 30 140 100 Only cookable on an Ogre Spit, found in the Ogre village southeast of Gu'Tanoth. Thin Snail Meat 35 70 50-70 Thin Snails is a drop by Blamish Snails. Jubbly 41 160 150 Kill a Jubbly bird, pick up the meat and cook over a Spitroast. Lean Snail Meat 45 80 80 Lean Snail is a drop by Blamish Snails. Kill an Oomlie Bird in the Khazari Jungle. Shake a Palm Tree and take the fallen leaf. Use the Palm Leaf on the Raw Meat. Fat Snail Meat 65 95 80-100 Fat Snail is a drop by Blamish Snails. Fish can be obtained using the Fishing skill, and are often the adventurer's first choice in food to bring along on a journey since they are quick to cook and restore many Life Points when eaten. Karambwan (poisonous) 1 80 -50 Cook for a Short Time on a stove or fire, after completing the Tai Bwo Wannai Trio Quest. Karambwan 30 190 180 Cook for a Long Time on a stove or fire, after completing the Tai Bwo Wannai Trio Quest. Cave Eel 38 115 70-110 Cave Eels are found in the Lumbridge Swamp Caves. Monkfish 62 150 160 Used in the Swan Song Quest. To make Bread, combine a Pot of Flour with some Water (either in a bucket or pot). You will then be prompted with a menu to select which type of dough to make. In the case of Bread, you should make Bread Dough. Regardless of which type of dough you make, it must be cooked on a Range. Pies are a type of food that is eaten in two bites. Each half of the pie will heal half of the pie's total replenishing amount. For example, if you eat one half of a Meat Pie, it will replenish 60 Life Points. the other half will remain in your inventory until it is eaten. Some pies also yield a stat bonus (eg. the Farming Pie boosts Farming by +3). Each bite will boost by the full amount, but the effects do not stack with one another (so, eating one bit immediately after the other will not boost Farming by +6). To make a pie, combine a Pot of Flour with some Water (either in a bucket or pot). You will then be prompted with a menu to select which type of dough to make. Select Pastry Dough, and use the newly-created dough with a Pie Dish to make an empty Pie Shell. Now, simply add the necessary fillings and cook the pie on a Range. You may also use the Lunar "Bake Pie" spell if you have access to the Lunar Magic spellbook, which guarantees that the pie will be cooked successfully. Redberry Pie 10 78 100 The main ingredient is one bunch of Redberries. Mud Pie 29 128 0 The main ingredients are Compost, Water and Dry Clay. This pie is not edible, and instead it is used as a Ranged weapon which lowers the target's Run Energy by 50%. +3 Farming The main ingredients are a Tomato, an Onion, and a Cabbage. +3 Fishing The main ingredients are a Potato, Trout, and a Cod. +5 Fishing The main ingredients are a Potato, Salmon, and a Tuna. +4 Range The main ingredients are Raw Bear Meat,Raw Chompy, andRaw Rabbit Meat. +10% Energy The main ingredients are a Strawberry, Watermelon, and a Cooking Apple. Pizzas, like pies, are eaten in two separate bites. Each half of the pizza will heal half of the pizza's total replenishing amount. to make a pizza, combine a Pot of Flour with some Water (either in a bucket or pot). You will then be prompted with a menu to select which type of dough to make. Select the Pizza Base type. Now add a Tomato and some Cheese to make a Plain Pizza. Now you must Bake the pizza in a Range. Afterwards, additional toppings, such a Cooked Meat or Pineapple, can be added to the pizza to increase its healing properties. Meat Pizza 45 169 160 Add some Cooked Meat to a Plain Pizza. Anchovy Pizza 55 182 180 Add cooked Anchovies to a Plain Pizza. Pineapple Pizza 65 195 220 Use a Knife on a Pineapple to cut it into slices. Use the slices on a Plain Pizza. First, cook a Potato on a Range. Next, add a Pat of Butter to the Baked Potato. You can now add a topping to your Potato With Butter. Baked Potatoes are only available to members. Potato With Butter 39 40 140 Cook a Potato on a Stove and add some Butter. Chilli Potato 41 125 140 Make a bowl of Chilli and add it to a Baked Potato with Butter. Potato With Cheese 47 80 160 Cook a Potato on a stove and add some Butter and Cheese. Egg Potato 51 150 160 Make a bowl of Egg and Tomato and add it to a Baked Potato with Butter. Mushroom Potato 64 230 200 Make a bowl of Mushrooms and Onions and add it to a Baked Potato with Butter. Tuna Potato 68 265 220 Make a bowl of Tuna and Corn (above), and add to a Baked Potato with Butter. Potato Toppings are added to Baked Potatoes to increase the number of life points they recover when eaten. They may also be eaten as-is, but obviously restore fewer Life Points than the complete meal would heal. Potato Toppings are a member-only feature. Use some Garlic and Gnome Spice on a Bowl. Make some Spicy Sauce, and add some cooked meat while holding a knife. Obtain a knife, bowl and an egg. Use the egg with the bowl and cook it over a stove. Obtain a knife, 2 bowls, an egg and tomato. Use the egg with one bowl and the tomato with the other. Cook the eggs over a stove, then add the tomatoes. Obtain a Bowl, Knife and an Onion. Use the Onion with the Bowl. Obtain a Bowl, Knife and some Mushrooms. Add the mushrooms to the bowl and cook over a range. Obtain a knife, mushroom, onion and 2 bowls. Add the mushroom and onion each to a separate bowl. Cook the onions and mushrooms over a stove, then add the mushrooms to the onions. While carrying a Knife, add a cooked Tuna to a bowl. Add a Roasted Corn to the bowl. Stews are made by combining a Bowl of Water, Potato, and a piece of Cooked Meat (or Cooked Chicken). The stew can then be cooked on either a Range or Fire. Make some stew and get some spices. Add the spices to the stew and cook it over a fire or stove. Cakes are a type of three-bite food, in which each of the three slices account for one-third of the cake's total healing properties. To make a cake, gather a Cake tin, Pot of Flour, Egg, and a Bucket of Milk. Now simply use one of the items with another (eg. use the Egg with the Cake Tin) to mix the ingredients into the Cake Tin. Now cook the cake on a Range to obtain a Cake, separated from its Cake Tin. Chocolate can also be added to the Cake by using a Chocolate Bar or Chocolate Dust on it to further enhance its healing properties. Fishcake 31 100 110 Obtain some Crab Meat, Kelp and Raw Cod and use them on each other to make a fishcake. You must have already made one during Recipe for Disaster. Dairy items are made on a Dairy Churn, and can only be created on Members worlds. Cream 21 18 10 Obtain some milk and use it on a Dairy Churn to make Cream. 22.5 - Cream 0 Obtain some milk or cream and use it on a Dairy Churn to make Butter. 23 - Butter 20 Get some milk, butter or cream and use it on a Dairy Churn to make Cheese. Wine is created by adding Grapes to a Jug of Water. After waiting approximately ten seconds, the Wine will ferment and either become a Jug of Wine, or a Jug of Bad Wine. Bad Wine yields no experience and does not heal any Life Points. Nettle Tea is made by adding Nettles to a Bowl of Water, creating Nettle Water. This can then be cooked on a Range or Fire to create Nettle Tea. Optionally, you can use the bowl of Nettle Tea with an Empty Cup. Also, you may add Milk to your tea, although it yields no additional effect to the tea. There are numerous drinks in RuneScape which can be brewed using the cooking skill. these drinks include Cider as well as ales and other alcoholic beverages. Many drinks yield a temporary stat boost when a player drinks them, but for the most part, they do not have any healing properties. Mature Ales offer a more potent skill level boost than their non-mature variants. To create Cider, bring 4 Buckets and 16 Apples to either the Keldagrim or Port Phasmatys brewery. Crush the Apples on the Cider Press to obtain Apple Mush, which must be collected in your empty Buckets. Add the buckets of Apple Mush to the Fermenting Vat, and then use some Ale Yeast on the Fermenting Vat. The Cider will then ferment, which can take quite awhile (24 hours or more). After it has finished fermenting, turn the valve on the Fermentation Vat and then collect the brew from the barrel using either Beer Glasses or Calquat Kegs. Each barrel will make 8 glasses of Cider. Ales are also created in either one of the Breweries. Add two Buckets of Water, two Barley Malts, the main ingredient, and finally a Pot of Ale Yeast to the Fermenting Vat. The order is important! Then, simply wait for it to ferment, and then collect it following the steps above. For a more detailed look at Brewing, please see our Brewing guide. Gnome foods and beverages are mainly involved in the Gnome Restaurant Activity, in which you take food orders from different NPCs, create the meal, and then deliver it. The various dishes you can create are made up of unconventional ingredients which are unique to Gnomic cuisine, and can be found in a cookbook which you can obtain from Aluft Gianne Sr. in the Tree Gnome Stronghold. After you offer your help to him, he will give you a series of dishes to prepare. Once he is satisfied that you are prepared, you can begin the Gnome Restaurant Activity! For more information about Gnome cuisine, please see our Gnome Food and Drinks guide. There are two drinks available to members which will temporarily boost your Cooking skill level when consumed. Once you reach level 99 Cooking, you can speak to the Head Chef in the Cooking Guild to purchase a Cooking Cape for 99,000gp. This can be used in place of a Chef's Hat to enter the guild. If you're the type of RuneScaper that's always on the run, and you're looking for a way to cook your food wherever you are (whether in the middle of the jungle, or on the sidewalks of Varrock), the mobile Roasting Spit is just the tool for you. Spits can be Smithed, and all you do is use it with either a piece of Rabbit Meat, or a Chompy Bird to skew it. Next, light a fire and use the skewed meat with it to set up a Rotisserie Cooker in just seconds! Due to how Crossbows are designed, they need a much stronger string than Flax can provide. So, you need to make some Sinew to string your Crossbow so that it can be used! It's actually very easy to make Sinew, and it only requires level 1 Cooking to do. Simply use a piece of Bear Meat (or Beef) with a Range, and choose to make it into Sinew rather than an edible piece of meat. And that's it! You can then spin the newly created piece of Sinew on a Spinning Wheel to get a Crossbow String, and then attach it to your crossbow (u) to complete it.